Will Probiotics Help With Gas? Everyone gets intestinal gas and most pass about 1 to 4 pints of it throughout the day, according to the National Digestive Diseases Information Clearinghouse. Although gas is normal, you may seek relief if you think you pass gas too frequently or if gas often builds up in your intestines and becomes uncomfortable. Taking certain types of probiotics on a daily basis could help reduce your discomfort. Your gut is full of microorganisms, but not all of them are bad. "Friendly" bacteria help protect your digestive system against disease-causing bacteria and allow you to properly digest and absorb what you consume, according to the National Center for Complementary and Alternative Medicine. However, some circumstances can offset the balance between good and bad bacteria. For instance, taking antibiotics can kill the good bacteria with the bad and infectious conditions can cause an increase in bad bacteria. If your intestines contain greater quantities of bad bacteria than friendly bacteria, you are susceptible to developing unwanted conditions such as persistent abdominal gas in addition to constipation, bloating and diarrhea. Consuming probiotics may help reduce excess gas problems by forming temporary colonies and giving your natural friendly bacteria some time to rebuild their army. Probiotics have also been linked to improvements in conditions such as irritable bowel syndrome and intestinal infections. 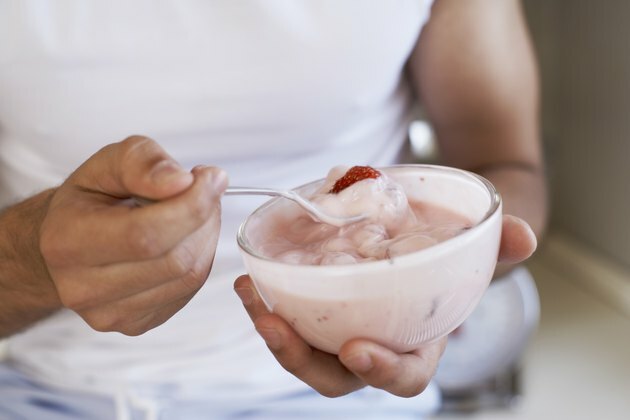 Eating yogurt, which is rich in probiotics, may also be more digestible for you even if you're lactose intolerant. In a 2000 study in the "American Journal of Gastroenterology," patients with irritable bowel syndrome that received a daily dose of probiotics for four weeks experienced significantly less flatulence than the group receiving the placebo. A 2006 study, also published in the "American Journal of Gastroenterology," found that another type of probiotic was significantly more effective than the placebo in reducing problems such as bloating and flatulence in patients with irritable bowel syndrome. In light of this promising evidence, further research would help draw a clearer link between the dosage and type of probiotics that is best for reducing gas problems. Any product containing probiotics should state "live and active cultures" on its label. Still, not all strains or species of probiotics are ideal for gas relief so ask your doctor to give you individualized advice. He can also give you sufficient forewarning regarding potential side effects of any product you choose. For instance, probiotics may actually cause mild temporary digestive issues such as gas and bloating in some people.